The DPI610is discontinued. Please see the PCL-2B as a possible replacement model, or contact our Pressure department at 1-800-826-6342 for more information. The DPI610’s advanced features make it the calibrator of choice for a wide range of applications. It can source and read pressure and current as well as voltages. In addition, a 10 or 24V supply can power current loops or pressure transducers. The DPI610’s dedicated task menus are easy to use. By simply pressing the TASK button, the user can choose between a number of pre-programmed tasks. These include P-I (pressure vs current); P-V (pressure vs voltage); LEAK TEST; PRESSURE SWITCH TEST; and several more advanced functions, including a square root function for flow measurements and mA step or ramp functions. A USER mode lets the user customize tasks. The DPI610 can store up to 20 displays in a cyclic buffer for later analysis. Data can be stored either manually or automatically at preset time intervals and can then be viewed on the screen or uploaded to a computer via the standard RS232 interface. The OMEGA DPI 610PC and DPI610HC pressure calibrators are available as a pneumatic calibrator with pressure ranges from -22 inHg to 300 psi with an internal pump that generates both pressure and vacuum. 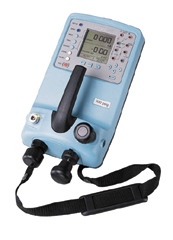 The pneumatic calibrator is compatible with most common gases. The hydraulic calibrator generates pressures up to 6000 psi from an internal screw pump and can read pressure up to 10,000 psi supplied from an external source. It is compatible with demineralized water and most hydraulic oils.